In 2004, the first Red Bull BC One Cypher went down at the cultural centre La Coupole in Biel. Fourteen years later, the world’s most prestigious breaking battle goes back to Switzerland. This time, the Hallenstadion in northern Zurich will host the clash of the world’s best breakers, on September 29, 2018. Since the beginning Red Bull BC One has been a forerunner of putting the extraordinary talent of the breaking scene on display. Over the years, it evolved to something much more important: a global celebration of hip hop culture that brings together the whole world around that one circular stage. From the streets to the top of the world. This year’s motto honors the possibility that a dancer can raise to international fame from wherever he is coming from. Your dance can take you everywhere irrespective of your origins, your religion or wealth. All that matters are your skills. The 16 spots in the BC One World Final are hard-fought. The judges select 15 of the finalists throughout the year. Those competitors will be revealed in the next few months as the decisions fall. In 28 countries, there is the chance to qualify in a local Red Bull BC One Cypher. 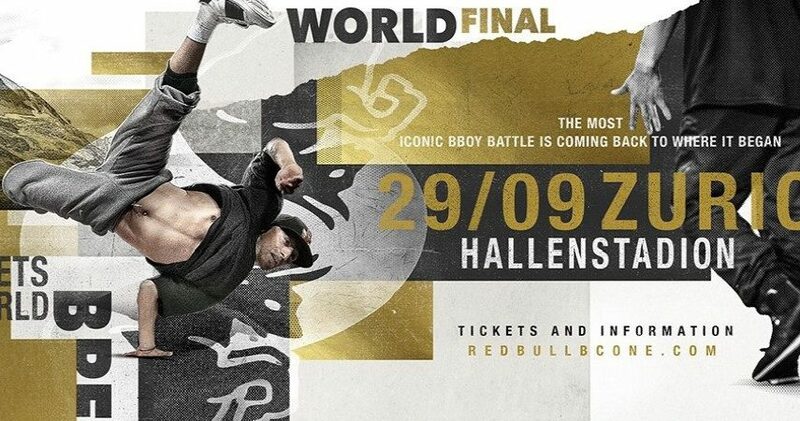 All the national finalists will be flown to the Last Chance Cypher in Zurich, to battle for the last free spot in the BC One World Final Line Up. The Last Chance Cypher will take place at on September 27. See the program of the BC One Camp 2018 here. IT’S TIME TO REVEAL THE 2018 RED BULL BC ONE CHAMPION!